From Mahler to military music, conducting to composition, the Who to woodwind quintets and everything else in between, Sergeant First Class J.G. Miller enjoys every aspect of the music industry. Born in Colorado into a family of music-loving medical professionals, he aspired to follow in their footsteps; however, he quickly discovered he enjoyed spending time in the practice room far more than the laboratory. He holds a DMA from the University of Southern California, a MM from the University of Arizona, and a BM from the Eastman School of Music in both Performance and Education, where he received the Performer’s Certificate. A member of The United States Army Field Band, SFC Miller logs thousands of miles over the road with this premier touring concert band, performing free concerts for the public, connecting citizens with their Army, and honoring those veterans who came before. His dedication to military musicians was recognized in 2017 as a recipient of the Finley R. Hamilton Outstanding Military Musician Award. 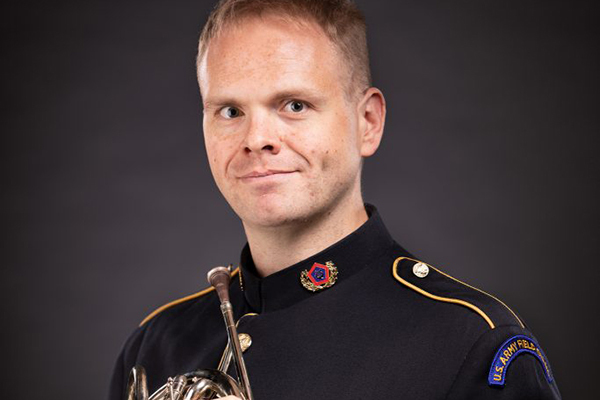 He is the founder of HornVets, an international advocacy group for current and former military horn players, and was the first to be elected to the position of Military Liaison to the International Horn Society. He has performed at numerous IHS Symposiums, most notably sharing the stage with his U.S. Army Field Band colleagues on the closing concert of the 50th Symposium at Ball State University in 2018. Prior to service, he was the brass leader for The Who’s Quadrophenia and More Tour, spending months on the road with the legendary rock band. He was active in the Los Angeles studio orchestras on several major motion picture soundtracks, including “The Amazing Spider-Man,” “Oblivion,” and “Snow White and the Huntsmen.” Additionally, he has performed with orchestras such as Rochester Philharmonic, Tucson Symphony Orchestra, and several regional orchestras in California. He is an active educator, having been staff member for a decade at Kendall Betts Horn Camp, where he focused on the development of the high school curriculum. He also taught in New York public schools at mostly high school levels, the Colburn Horn Camp, and the Hartwick College Music Festival, continuing regular masterclasses throughout the U.S as a member of The United States Army Field Band. He garnered several accolades in his efforts to educate the next generation including the University of Arizona President’s Award for Community Outreach, along with the Brandon P. Mehrle Award for Distinguished Service to the USC community. As a composer and arranger, Miller’s works compositions have been performed around the world. He was honored to compose “The United States Cyber Command March,” premiered by The United States Army Field Band at the National Security Agency in 2018. He serves as Vice President of Veritas Musica Publishing, founded by American composer Wayne Lu. His horn teachers include Peter Kurau, James Thatcher, Daniel Katzen, and the late Kendall Betts. With as much time as he spends on the road, there’s no place quite like home: he enjoys spending time at home with his wife, two children, and dog in Maryland. His hobbies include St. Louis baseball, eSports, and visiting public museums and national parks.